Real Time Gaming have released their latest game Gemtopia and its one not to be missed! Set in a vibrant, glistening underground cave where all manner of riches and colorful gems are just waiting to be discovered. Can you find the precious stones and win yourself a life changing sum of money in the process? We run through the main features including free game features, symbols and jackpot rules. Paylines – There are 15 variable across 5 game lines, giving you lots of opportunity to hit the jackpot over the course of a game. Jackpot rules – Progressive jackpots can be won at the end of any game, so you can win big on each and every spin you make. Substitute rules – “Wild” appears on reels 2, 3 and 4 and counts for all symbols except “Free Games” and “Bonus”. “Wild” will expand to cover all positions on its reel, before pays are awarded. Wild re-spin feature trigger – A re-spin is triggered when 1 or more “expanded” wild appear. Wild re-spin feature – All reels with expanded “Wild” are held while the other reels re-spin once (after pays are awarded) If, after a re-spin 1 or more re-spinning reels have expanded “Wild”, all reels with expanded “Wild” are held while another re-spin occurs. Pays are awarded after each re-spin and are played at the lines and bet of the triggering game. Free games feature trigger – 15 free games are awarded whenever “Free Games” gems appear on reels 2, 3 and four. Free games feature – 3 extra games and instant prizes are awarded whenever 3 “bonus” gems appear in a free game. Touch each “bonus” gem to reveal prizes of up to 1,000x bet. 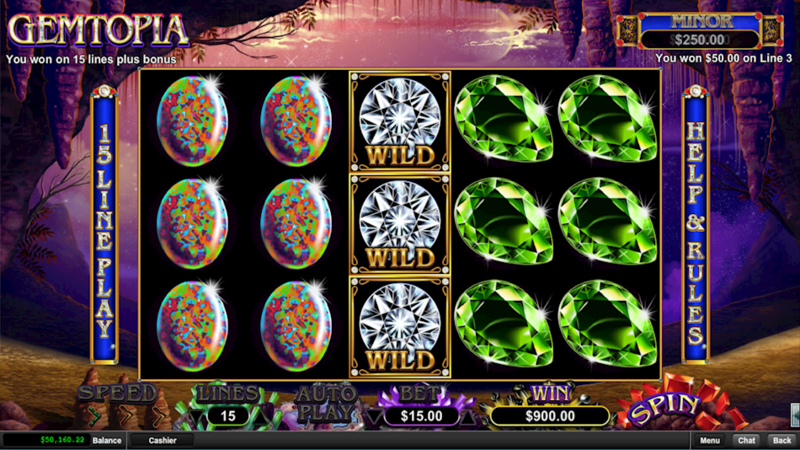 Wild re-spins can occur during free games. “Free Games” gems do not appear during free games. Free games are played at the lines and bet of the triggering game. Gemtopia is available to play via download, instant play, mobile, kiosk or mini game. Gemtopia is a fantastic addition to the Real Time Gaming slot library, with it’s glittering graphics, smooth gameplay and generous jackpot offering it’s sure to be a hit with slot fans. Those new to slot games have the opportunity to play in free mode for practice, or simply use the auto play function so you can sit back, relax and watch the gem hunting fun unfold.